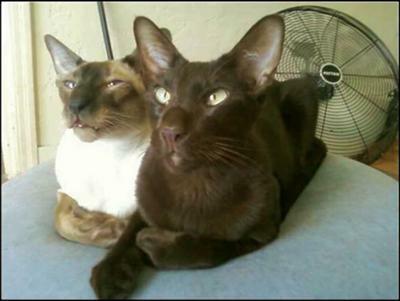 When I moved from Toronto to Los Angeles, I had to find a temporary two-month home for my cats, Winchester (Siamese) and Oberon (Oriental) while I got settled into my new place. I found a lovely couple who had had an Oriental, and were eager to take care of them. They set aside a small den for the cats to become accustomed to in their short-term home. When I dropped them off, I stayed with them in the room for a period of time - and because I was there, they quickly adapted to it. However, once I left, they vanished to the INSIDE of this sofa bed. Whenever anyone entered the room, which was kept closed at the beginning, they'd zip back to their secure little hiding spot. I thought - well, hoped - this would pass within a couple of days. I spoke with the woman numerous times, trying to come up with ways to get them to come out, but nothing seemed to work. Two weeks passed. The cats remained hidden, though of course they'd come out to eat when the room was sans people, and represent themselves accordingly in the litter box. The woman came up with a brainwave! She said I should record my voice and email her an MP3. So, I recited all my coquettish cat yammerings, and sent it to her. She played it on the computer in the den, and immediately began to hear some intense meowing coming from inside the sofa. Then out pops one head ... and then another. Though there was still some coaxing to be done thereafter, the major ice was broken. Within a day or two Winchester and Oberon were settled and had the run of the house. I was extremely relieved. You can see Paul's notes on clipping cat claws here, as well as a lovely close-up of Seal Point Siamese Winchester. Cats often do get a bit scared in new surroundings; I've heard of some rescue cats taking up to six months to find enough confidence to come out from their hiding place or 'safe house' and enjoy the company of their new human companions. So I think yours did very well, and the idea of recording your voice to coax them out was wonderful! Thanks for stopping by again - I'll link your posts up to each other so folks can see them both.